A worker at the massive electronics firm Foxconn’s Shenzhen plant is said to have just committed suicide by jumping from the roof of a building. This incident is a tragedy by itself, but it is made more so by the fact that this is the ninth time that a Foxconn employee has killed himself or herself in the past year. Who will be the next? The company must initiate a thoroughgoing analysis of life on its production lines—not just roll out more superficial, short-term fixes. 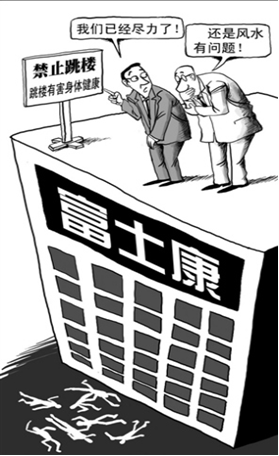 China Labor Watch has long reported on problems at the Taiwan-based giant’s operations in Mainland China. After this ninth death, CLW followed up with 25 Foxconn workers to get their opinions on May 17, 2010. Their responses confirmed many of our criticisms of the manufacturer. Not all workers can adapt to such an intensive workload, even when experienced. They therefore have to ask for leave to rest, causing their wages to be deducted (and adding to their workload later on). The 25 workers we spoke to talked about the recent suicide but their opinions on it varied. Seventeen of them attributed the worker’s death to high pressure. Five of them complained about a poor sense of community in the factory, describing the plant as lacking communication and love. At Foxconn, they said, even workers living in the same dormitory do not come to know each other and do not even greet each other. Three employees said they were dubious about the factory’s explanation of the workers’ death because of the suspicious circumstances that have surrounded other suicides. For example, Foxconn said that another employee, Ma Xiangqian, died because he fell from a building. However, because of Ma’s extensive head wounds, some workers suspected that he was beaten to death instead. They believed that the factory deleted a video of the beating. CLW Executive Director Li Qiang has highlighted several possible reasons for the suicides: Foxconn’s military-style administration and harsh working conditions, Taiwanese administrators’ disrespect for mainland workers, and management strategies aimed at the creation of only short-term jobs. Employees of Foxconn work punishing hours. The earliest shift begins at at 7:30 AM and ends at 4:30 PM, with two one-hour rest periods, one at noon and one in the afternoon. Workers on this shift have a “normal” workday that is eight hours long, but this figure does not include overtime, which typically lasts from 5:00 - 7:30 PM. In other words, they actually put in 10-hour days. Workers on the second shift put in 12 hours per day, with the same two hours of rest as their early morning co-workers. These hours are often endured standing up the whole time. The factory has arranged for workers to take one day of rest every 7 days after May. Before May, they can be on leave for one day in every 13 days; if they take a day of leave on a working day, they have to work overtime for an additional day over the weekend. That is to say, some workers are on the line every day of the month. According to regulations of Foxconn, employees must attend two staff meetings. One is held in the morning, before work starts, and one in the evening, after work ends. These meetings last approximately 10 to 30 minutes, and workers are not paid for this time. Workers are paid by the hour. Their wage is their basic wage plus their wage for overtime work. The basic wage is 900 RMB per month—or Shenzhen’s legal minimum wage for work outside of the Special Economic Zone. Working overtime on a normal workday earns a worker 7.8 RMB per hour, while weekend work is compensated at 10.34 RMB per hour. During our recent interviews, what workers complained about most often was the great pressure they were under. While 15 of the workers we interviewed said they could adapt to work at Foxconn, 7 said they could not and three were unwilling to talk about their experiences. It is true that Foxconn provides workers with a complaint box and and a hotline for psychological assistance. There is an enterprise-level branch of the All China Federation of Trade Unions at the factory. But few workers have ever used any of these channels. They are but an empty shell. Some workers are even worried that if they appeal for help, the administrators will deliberately make things more difficult for them.